Students, faculty and staff of California State University, East Bay have access on its Hayward campus to the world’s largest car sharing service, Zipcar, thanks to a partnership between the university’s Enterprise Operations Department, Associated Students and Zipcar. Zipcar offers members of the campus community a convenient, economical and environmentally friendly alternative to owning a car, according to Mark Almeida, director of Enterprise Operations at CSUEB. Two self-service, fuel efficient Zipcars are housed in parking spaces adjacent to the Pioneer Heights Student Apartments complex. The Zipcars are available to all staff and students who are at least 18 years of age. Gas, insurance, 180 free miles, reserved parking and roadside assistance are included in low hourly and daily rates, Almeida said. Faculty, staff, and students can join Zipcar for an initial membership of $35 and then drive for as little as $8 per hour or $66 per day weekdays and $9 per hour or $72 per day on weekends. Students also get $35 in free driving credit as part of the Zipcar launch promotion at CSUEB. Local residents ages 21 and older can also join Zipcar for $75 ($25 one-time application fee and $50 annual fee). All members 21 and over have access to Zipcar's network of more than 6,000 vehicles throughout the UK and North America. 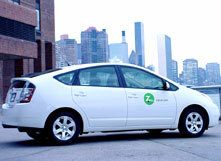 Zipcar, which has been offering campus car sharing since 2002, has programs at more than 150 private and state colleges and universities across the country, including MIT, Columbia University, Georgetown University, American University, USC, Harvard University, University of Florida, University of Michigan, University of Minnesota, University of Toronto, University of North Carolina, Duke University, The University of Chicago, UCLA and Amherst College. "As universities continue to encourage people to leave their cars at home by investing in transportation-demand management programs like transit passes, bike lockers, ridesharing and vanpooling, Zipcar provides the missing link -- access to a car on campus," said Malloy. More information, including how to join or learn more about Zipcar at California State University, East Bay, is available at www.zipcar.com/csueastbay. Zipcar is the world's leading car-sharing service with 350,000 members and more than 6,000 vehicles in urban areas and college campuses throughout 28 North American states and provinces as well as in London, England. As a leader in urban transportation, Zipcar offers more than 30 makes and models of self-service vehicles by the hour or day to savvy city residents and businesses looking for an alternative to the high costs and hassles of owning a car in the city. More information is available at www.zipcar.com.